With PicaLoader's Task window, you can organize your task within current project, you can rename, enable or disable your tasks, and you can browse your pictures by task. 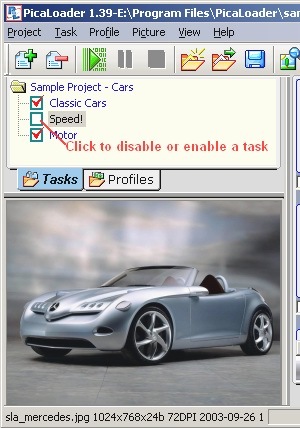 If a task is disabled, PicaLoader will not download picture from this task next time. You can right click on a task and select "Rename task" to give it a new name. A task is like a folder of Windows Explorer, when you select a task, the browse window will only display pictures belong to this task, but select the task tree's root, the browse window will show you all of the pictures within this project.